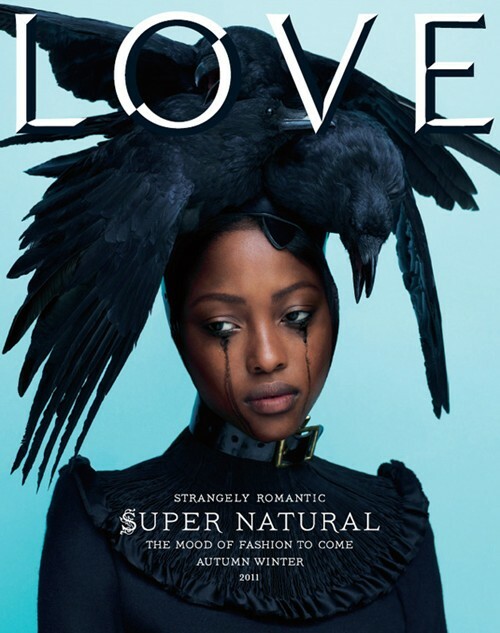 I am absolutely in ‘LOVE’ with LOVE magazine’s Autumn/Winter cover. Model Nyasha Matonhodze ( who also star’s in Louis Vuitton’s Fall campaign) was photographed by the esteemed photography duo Mert Alas and Marcus Piggott. I always look forward to every LOVE magazine issue due to their striking covers, like model Agyness Deyn dressed up as the queen, or Kate Moss and Lea T having a lesbian kiss. The covers have always managed to suprise me and this issue, which is out August 1st, certainly does not disapoint. Louis Vuitton has released their Fall winter 2011 ad campaign. After a show of feathers and fetishism with a 40’s feel, it was interesting to see how they interpreted the collection through an image. They did not disappoint. Marc Jacobs (designer for Louis Vuitton) wanted to use up-and-coming models in this campaign, which is different for the brand as they usually use a celebrity or supermodel. 16 year old Nyasha Matonhodze has been picked as one of the lucky girls to be the face of the brand. Quite an achievement, don’t you think?